How to make sense of property data? In today’s fast-paced and data-driven business world, real estate professionals face the challenge of making sense of property data. Meaning, they have to be able to interpret data and make decisions based on that quickly. How to make that happen then? Thorough understanding of data doesn’t, unfortunately, come from analyzing endless spreadsheets and parsing information manually together from different data sources. For understanding data, spotting deviations and seeing trends, your data has to be in a form that is something else than black-and-white, dull numbers. It has to be something that is simple, easy to glance at and understandable. In other words, it has to be visualized. There’s no such thing as “visualized property data” – or is there? In many fields of the real estate sector, property data is still predominantly managed in files, Excel, and other spreadsheets. This is surprising because we all know that this is not the best or the most efficient way to manage data. The cold truth is that whether you are an asset manager, a business owner or a property investor, you have to understand what you’re numbers are telling you. Not analyzing your numbers is like throwing money away from the 15th floor. So, what is visualized data? What can you do with it? Most importantly, why do you need it? Data visualization is a general term of placing data in a visual context. It helps people understand better the significance of their data (Source: TechTarget). What do you want to know from your data? What KPIs you should follow to make better business decisions? For example, if you’re a property manager, one of your goals could be maximizing your property’s yield. This means that you have to, among other things, minimize your property portfolio’s expenses. For doing so, you need to know what are your portfolio’s expenses per month, weekly and so on. Now, you can decide that one of the KPIs you’ll be following is e.g. OPEX every other week. In this case, when you have decided to follow OPEX on a regular basis, visualizing the metric will make your understanding faster and more profound. Read further to find out the reason why. 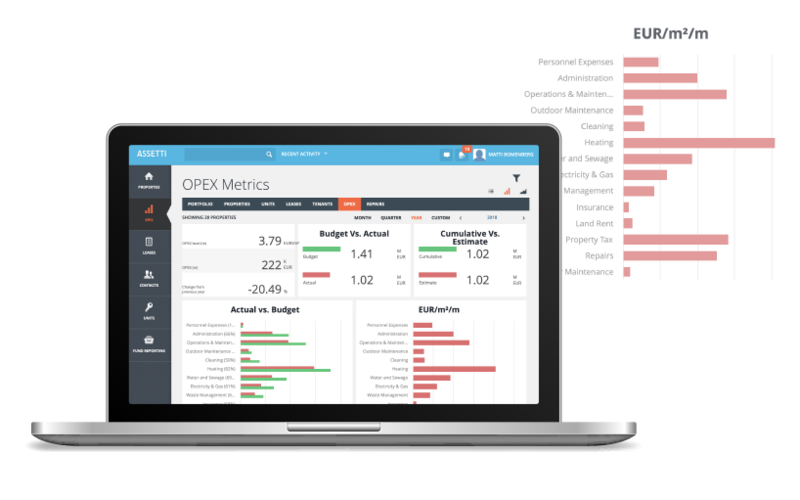 An example of how Assetti visualizes user’s property asset data such as OPEX metrics. The human brain is a funny organ. It understands and handles information better and faster when data is visualized. According to some sources, it is claimed that brain processes visual information 60 000 times faster than text. Most of the information transmitted to the brain is – you guessed – in visual form. The brain also works fast with images. MIT neuroscientists have found in their studies that the brain can identify images seen for as little as 13 milliseconds. Also – and sadly – with the news flood we expose ourselves to every day our attention span is constantly decreasing (we are almost at the level of goldfish according to Venturebeat). It is crucial for efficient working that we are able to present information in a way that matches to our need to understand. For the reasons mentioned above, it is important for efficient working that we are able to present information in a way that matches our need to understand. Data visualization turns numbers, calculations, and letters into aesthetic visuals. They can be dashboards, infographics, interactive images or even funny gifs! Visual representations help you to recognize patterns and, for example, deviations from those patterns. As you can see, there are many options to choose from. 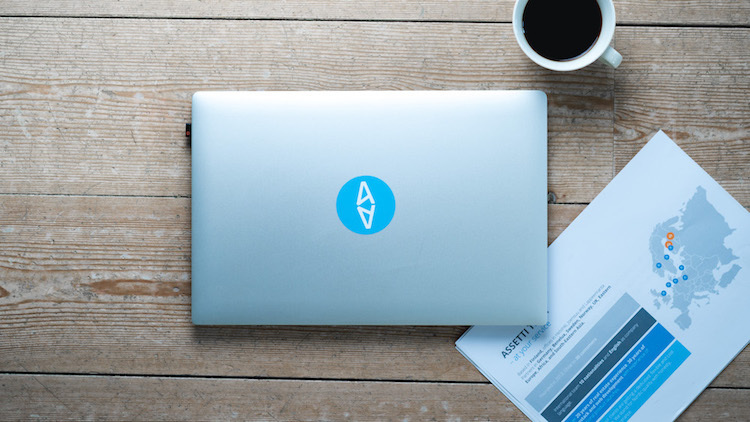 This gives you the freedom to decide what kind of data visualization makes the most sense to you and serves you the best way. But remember: even though visualized data might look esthetically pretty and nice, you always have to understand what it’s telling you about your business. With visualized data, you can view and understand vast amounts of information at a glance. Especially when making business decisions, essential patterns and important insights may not be noticed in a data spreadsheet or other such file. The same information, for example, on a pie chart brings insights visual and more obvious. You can easily see the patterns that occur between operations and business performance, and thus see how your daily tasks impact your overall business performance. Instead of having to use the time to compare numeric figures from rows and columns, the differences between chosen datasets can be seen at a glance – and different scenarios modeled based on visual perception. By visualizing your data you can take actions faster. By seeing your data not only in numbers in a spreadsheet but also seeing the visualized figures, you can identify also the “why’s” and take actions based on what you see. Property data can be beautiful! Visualizing property related data can give better knowledge e.g. for asset managers and investors by helping to compare different datasets easily. It helps in picking up differences and seeing different patterns quickly. It reveals trends, sets data into context, saves time, gives perspective and last but not least – stimulates the imagination of the viewer. It’s time for us to understand that data can also be beautiful. Data doesn’t always have to mean dull, black and white numbers in a spreadsheet jungle. These numbers are not easy to understand and it’s harder to make actions based on them. The best part is that a great variety of software has already been designed to bring essential data to a visual form, in a certain context, and to certain user profiles. Assetti, of course, is one.